How can you really make a difference for your students? 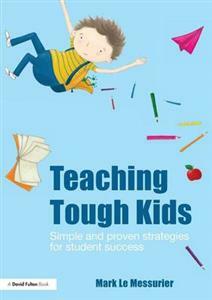 Teaching Tough Kids delivers a refreshing collection of realistic ideas to sustain the organisational and behavioural transformations of all students, particularly those who 'do it tough'; who learn and react differently. They are complex kids who find life tougher than most. Managing their emotion and behaviour presents educators with a spectacular challenge in schools today, and numbers are on the rise. Filled with inspirational case studies, this book focuses on building improved relationships, structures and behaviours, rather than seeing the student as 'the problem' that must be fixed. Highlighting the value of promoting positive connections with students of all ages, the author presents ways to incorporate inclusive ideas into everyday practice and construct pathways for students to become engaged in their learning and achieve success. This stimulating book shows teachers how to: build student connectedness to learning; set achievable goals for each individual child; support emotional stability; strengthen organisation patterns; address behavioural issues; improve homework planning; create friendships and deal with bullying. Teaching Tough Kids takes a particularly close focus on students identified with Learning Disability, Attention Deficit Disorder, Attention Deficit Hyperactivity Disorder, Oppositional Defiant Disorder and Asperger Syndrome. Another group of students with executive functioning difficulties are emerging in schools. These are the kids who have endured neglect or too much stress and uncertainty in their lives and as a result display classic symptoms of hyperactivity, hyper vigilance and impulsivity. Teaching Tough Kids will be of immense interest to teachers, student teachers, staff in Pupil Referral Units, SENCos and all those involved with Behaviour Support work.